It's the last stop on our Very Merry Christmas Giveaway Hop. If you've been following along all week, then you are finishing up right here with me and my personal picks to include in the giveaway. I don't think it is any secret how much I love Country Charm and Clear Cut Stackers: Pinking Squares. I can honestly say that I use these products more than any other at the moment. I love creating patchwork backgrounds using the "fabric swatches" included in Country Charm. And the pinking squares are the perfect backdrop for any focal point. 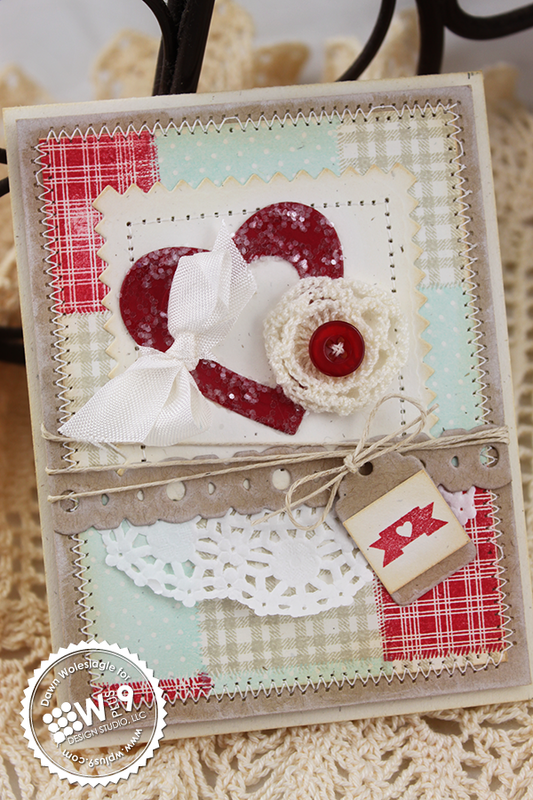 I also used our Clear Cut Stackers: Hearts to create a little heart shaped frame. 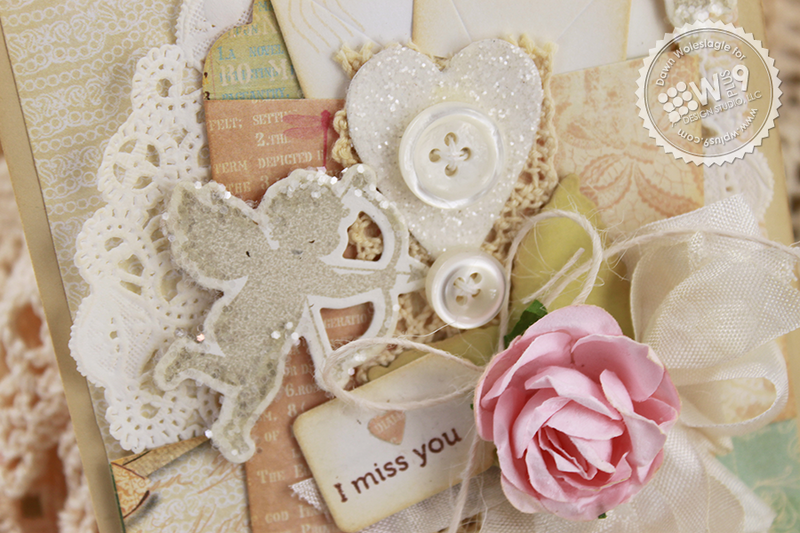 A little glitter, a crochet flower and a button create a perfect little trio of love. 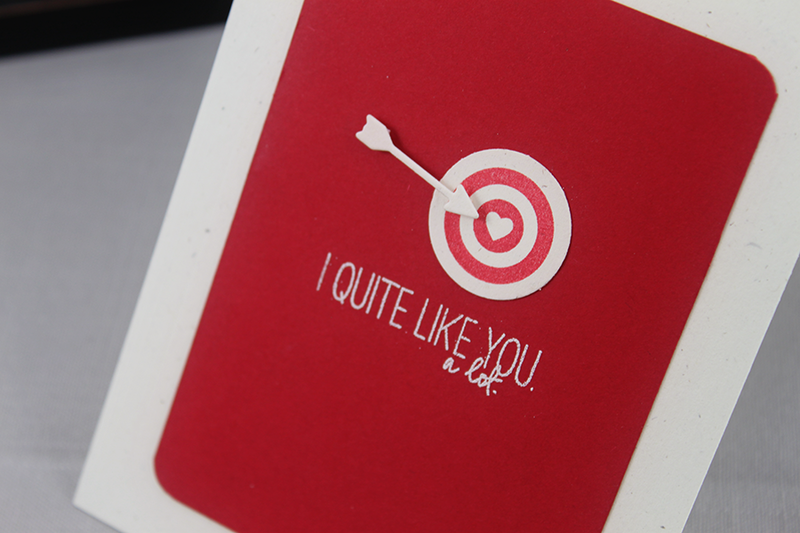 I've also used our Oatmeal and Kraft card stock (also included in the prize package) along with our Cupid's Bow card stock. 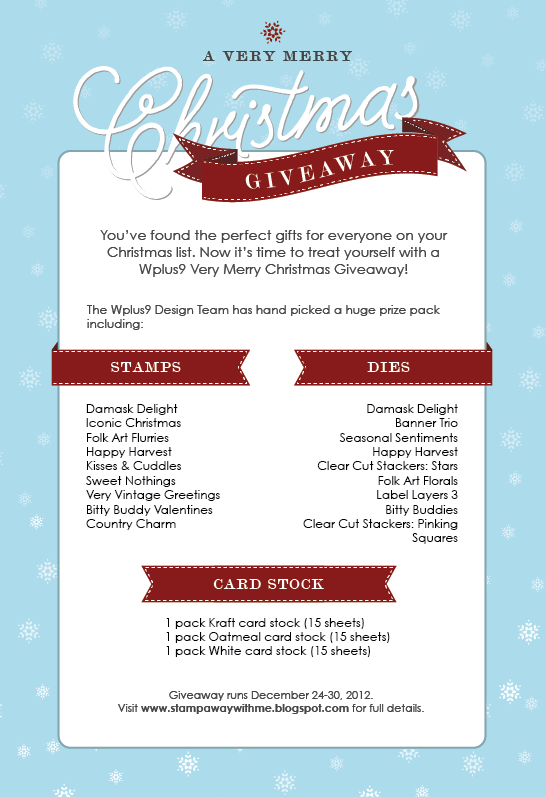 Here's a quick recap of everything included in the A Very Merry Christmas Giveaway package. That's more than $275 in value! Friday 12/28 - Finish up, right here with me, Dawn Woleslagle. The giveaway runs Monday, December 24, 2012 through Sunday, December 30, 2012 EST.. Entering is as easy as leaving a comment. Hop around to the Design Team members' blogs all week long and don't forget to leave a comment on each blog, each day…that's up to 9 entries! If you miss a day, don't worry, comments will be open until 11:59 p.m. EST 12/30/12 so you can catch up. ONE random winner will be selected from all comments combined on January 1, 2013 here on the blog. Help us spread the word on Facebook and/or Twitter and you can leave a comment on this post for up to 2 extra entries. The tree is decorated, the gifts have all been carefully selected and wrapped to perfection. The smell of fresh baked cookies is lingering in the air. Christmas is almost here! But before we know it, all of the excitement will crest in a frenzy of paper and squeals and then it will all be over. I'm always a little sad at how quickly it all comes to an end and then it's back to business as usual. You too? Well we've put together a little treat to help you beat those post Christmas blues! The giveaway starts Monday, December 24, 2012.. Entering is as easy as leaving a comment. Hop around to the Design Team members' blogs all week long and don't forget to leave a comment on each blog, each day…that's up to 9 entries! If you miss a day, don't worry, comments will be open until 11:59 p.m. EST 12/30/12 so you can catch up. ONE random winner will be selected from all comments combined on January 1, 2013 here on the blog. It's Release Day! 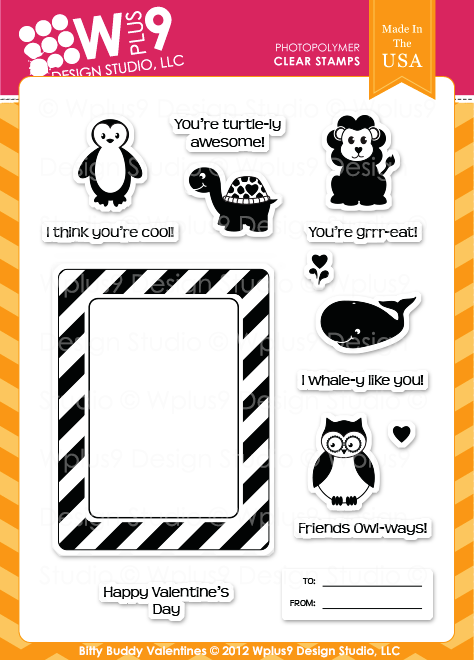 All of our December/January 2013 release products are now available for purchase at www.wplus9.com. Don't forget, if we run out of something that you simply must have right now, you can also find Wplus9 products at many of your favorite retailers! Check our retailer's page for a list of where to find us. Release Day is also Group post day. It's the day that I get the pleasure of showcasing the Design Team with their final parting release projects. And let me just say, the pleasure is all MINE! 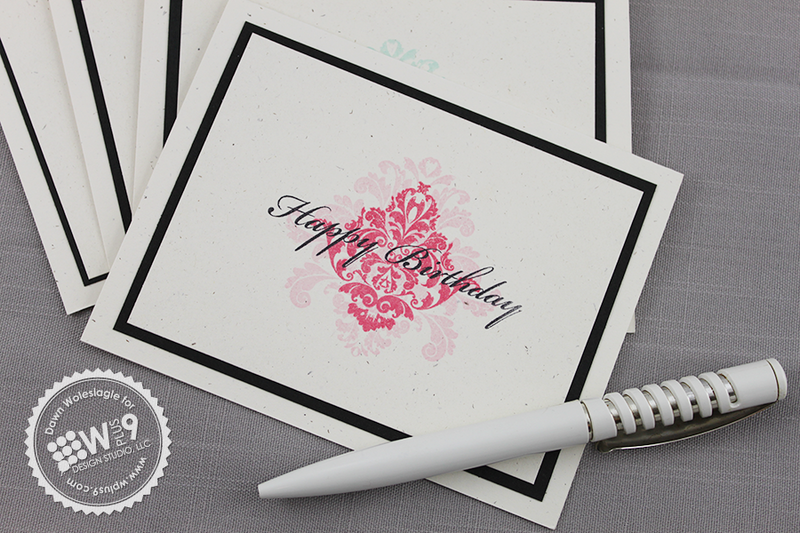 The use of the pastel colors paired with the stark black and white along with all of those graphic elements is what really makes this card. 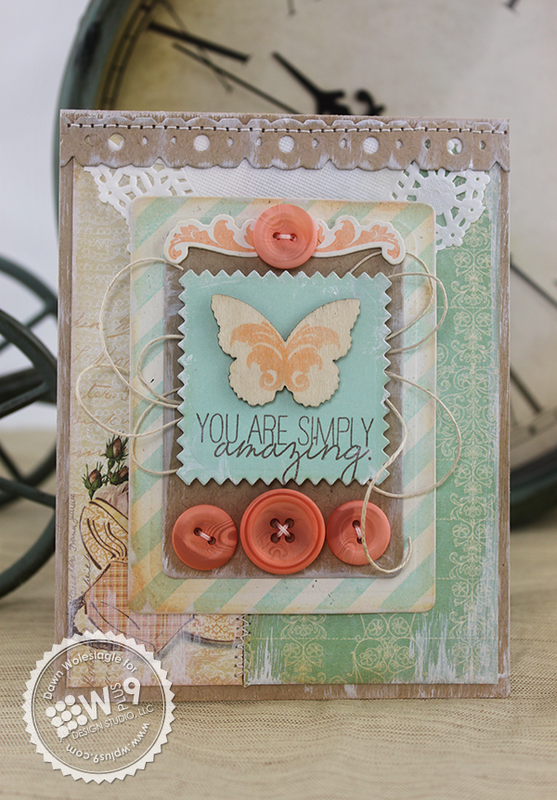 The pattern Cristina created with the arrows from Cupid's Arrow keeps it on trendy. The diagonal stripes she's added along the edge keeps it classic. What a perfect balance! 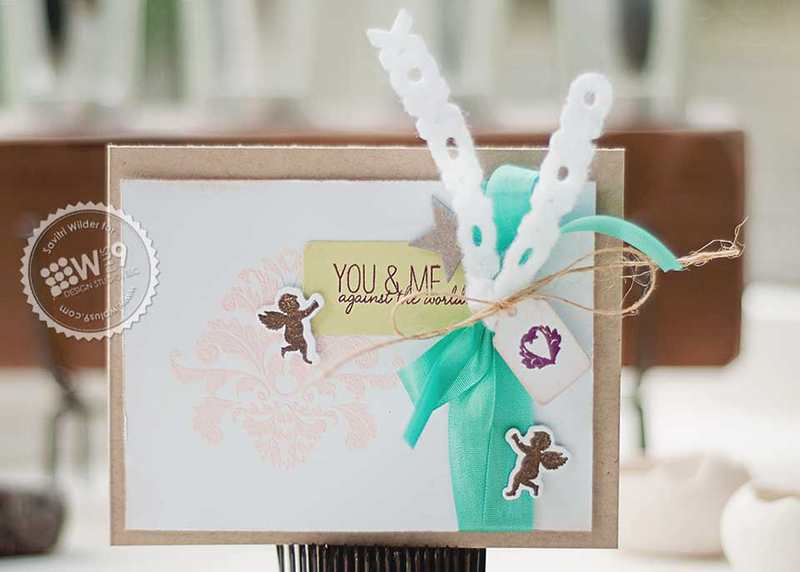 Elise always finds the most creative ways to use stamps and supplies. I always come away inspired, and this is no exception. 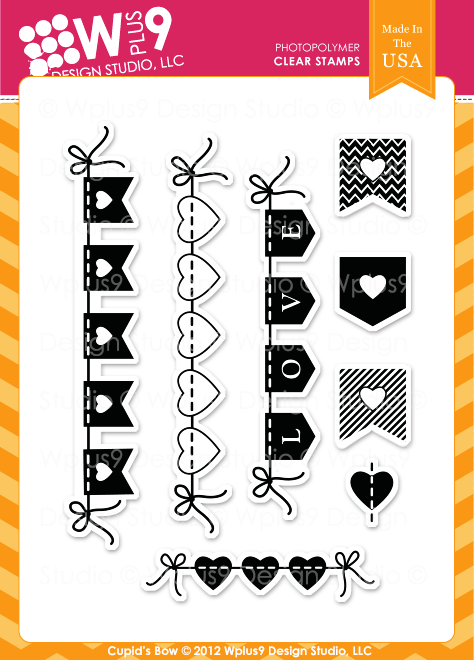 Just check out how she's used the banners from Banner Love to create that prize ribbon. Genius. Jean gave me two to choose from today and I had a hard time deciding. But in the end, this gorgeous monochromatic number won me over. 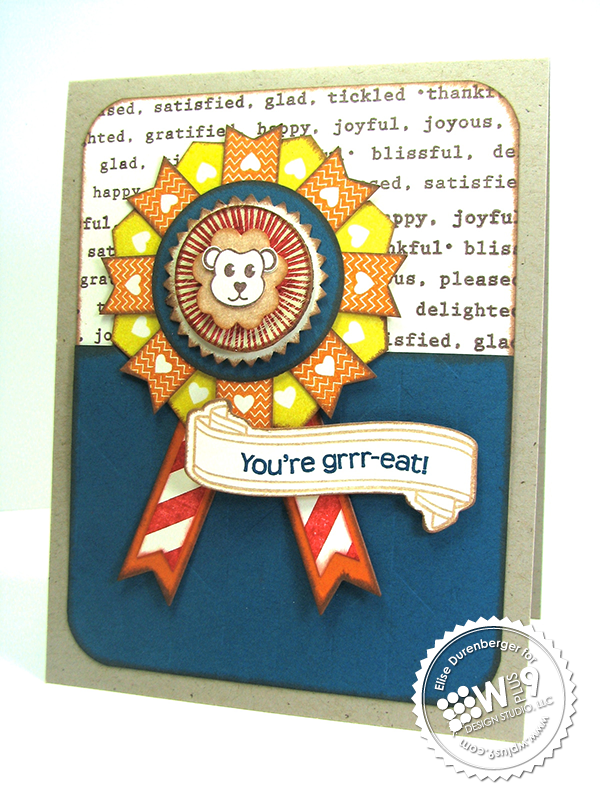 I think it was the unexpected pop of red that she added with the XOXO Border Die that did me in. Effortlessly elegant. 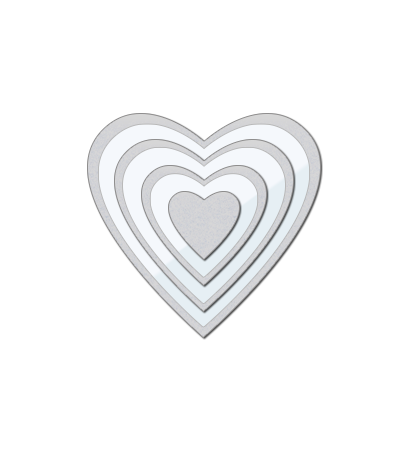 It's no secret that I am a sucker for hearts and Jinny's got them in abundance with our Clear Cut Stackers: Hearts die. The stamping she's added is icing on the cake. Put them in a pocket? I'm all over this one! Did you know that Kerrianne is a hopeless romantic? I did! 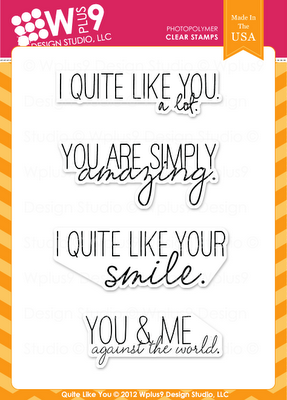 So I know that this card was inspired by her upcoming nuptials! The cupid from Cupid's Arrow is the perfect finishing touch for this Parisian masterpiece. Leah always has the most amazing color combinations! What really stands out to me on this card is her use of Banner Love. The sentiment is framed beautifully and the little pennants she added to the left add a touch of fun. Sarah has an unmistakeable style. Her use of colors and layers has always intrigued me. I love how she has mixed graphic elements like the chevron patterned paper and bulls eye stamp, with more vintage elements like the tissue and trim. I love Savitri's eclectic mix of elements. She has a perfect balance of whimsy, sophistication and elegance. 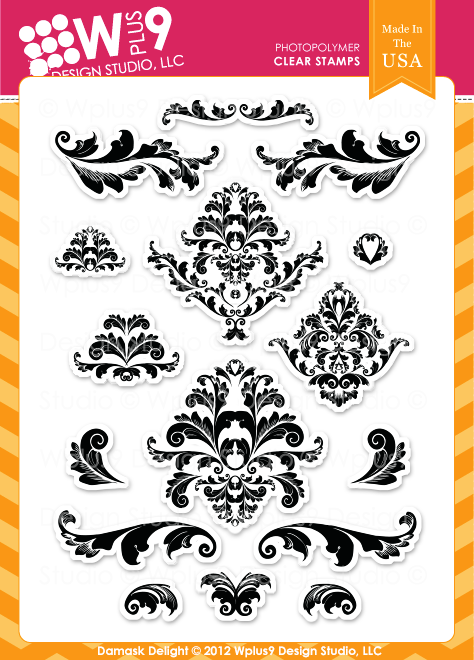 The damask image she's added from Damask Delight is the perfect choice to ground all of the separate elements. And that officially concludes our December/January Release Week festivities. Thank you so much for joining us. I hope you are having a wonderful holiday season filled with family and lots of love! It's time for the full reveal! Time to show you what we are releasing this month in their entirety. All products will be available for purchase at midnight, on December 5th at www.wplus9.com and our retailers. Wplus9.com will be down from approximately 11:00 PM EST tonight until 12:00 AM EST while we upload the new products and prepare for the release. The website will be back online and everything will be available for purchase by 12:01 AM EST December 5th. 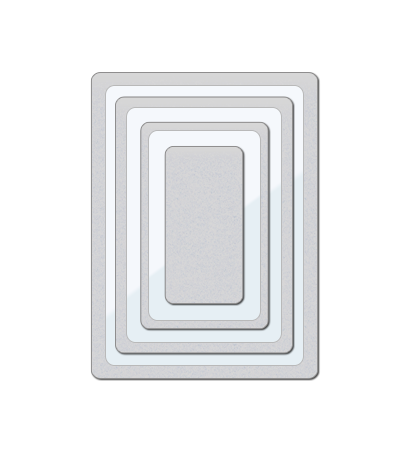 cuts 4 graduated rounded rectangles in the following sizes: 3 7/8 x 2 7/8", 3 1/4 x 2 1/4, 2 5/8 x 1 5/8", and 2 x 1"
measures approx. 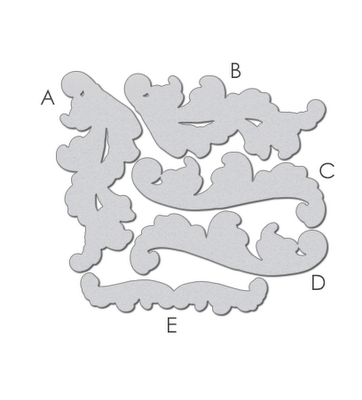 7 1/4 x 1/2"
cuts 4 graduated hearts in the following sizes: 3 1/4", 2 1/2", 1 3/4", and 1"
As always, I have enjoyed spending the last couple of days sharing all of the new product with all of you! You all leave the nicest comments. I read each and every one and am so grateful for the feedback! So, how about one more giveaway? Want to win the entire release? Including everything listed above. Just leave a comment by 10:00 PM EST TONIGHT December 4th to enter. I will select one random winner from all comments. 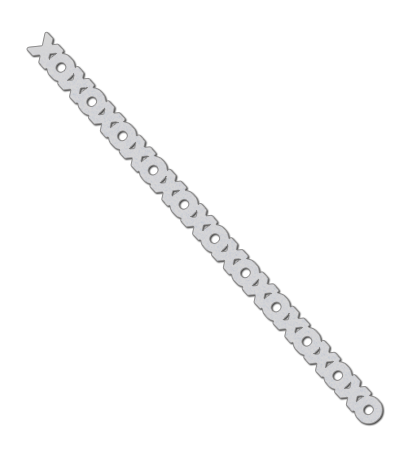 Winners will be posted here by 11:00 PM EST. If you've missed any of this week, be sure to catch up and visit the Design Team as well. They have worked their magic yet again! Good Luck! I'll be back tomorrow with a group post featuring the talented Wplus9 Design Team! Welcome to the third day of our December/January release. If you are just joining us, you can start at Day 1 to catch up. Thank you all so much for all of the the kind words and excitement over this release! I am so happy to hear how much you are loving on Cupid. He is my favorite! Today, we are introducing the last of our new products for this release. First let's take a look at a little set with a lot of style, Quite Like You. 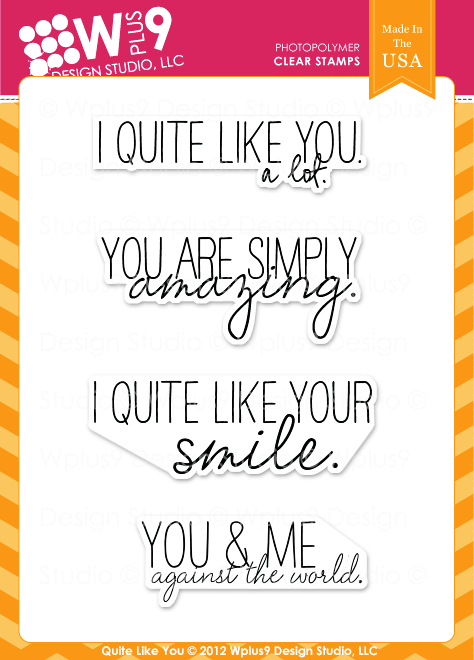 This font style is so huge right now and I just couldn't resist putting together an affordable little sentiment set. I wanted something super simple and to the point for this card. 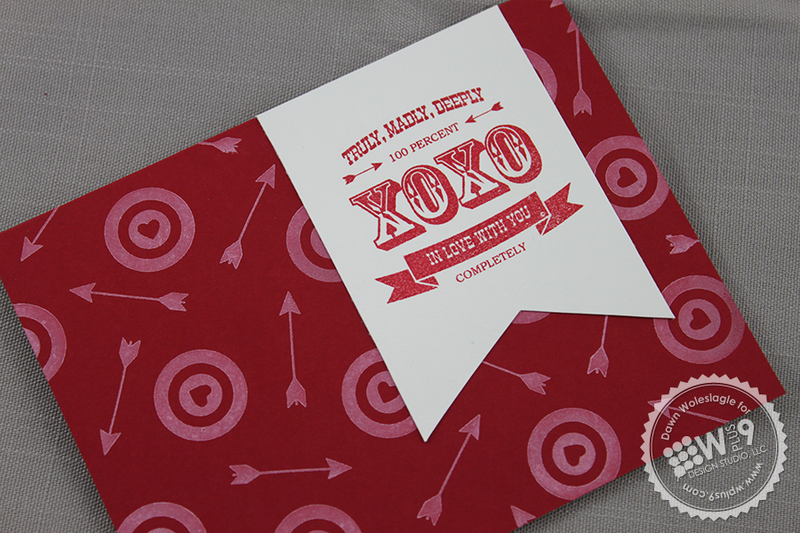 I stamped the target from Cupid's Arrow and used a 1" circle punch to cut it out. I couldn't resist adding the arrow from the Cupid's Arrow Companion die. It was just too perfect. 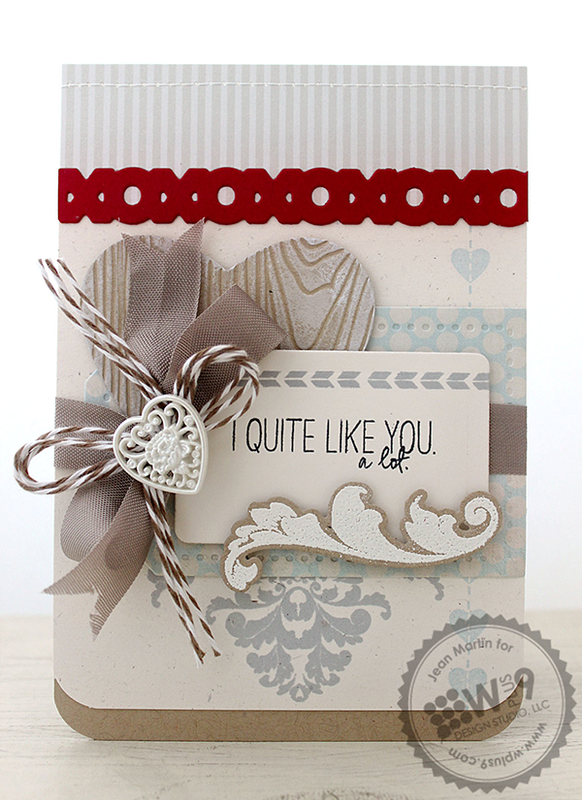 The sentiment is from Quite Like You and I heat embossed it in white onto our Cupid's Bow card stock. I love how tall and skinny the font is, yet still thick enough for a solid emboss. 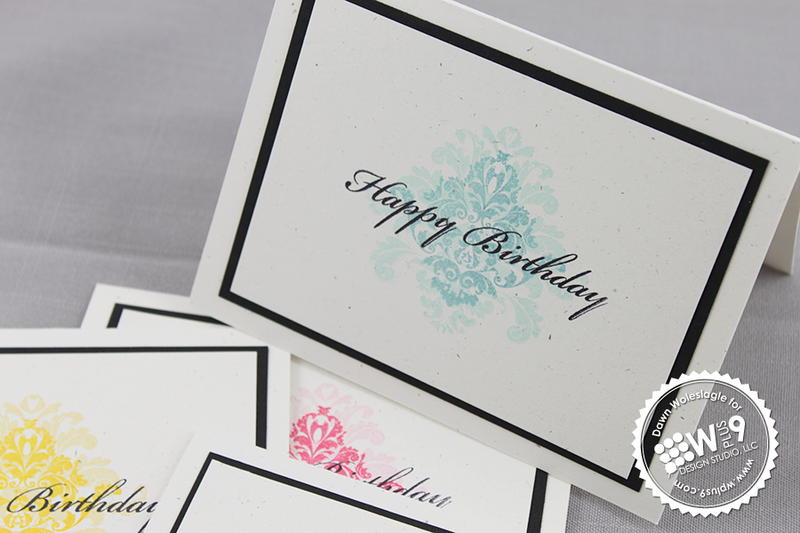 Next, I wanted to take this modern font combo and incorporate it into a more shabby card along with the Damask Delight stamps and dies. I am so happy with how it turned out! 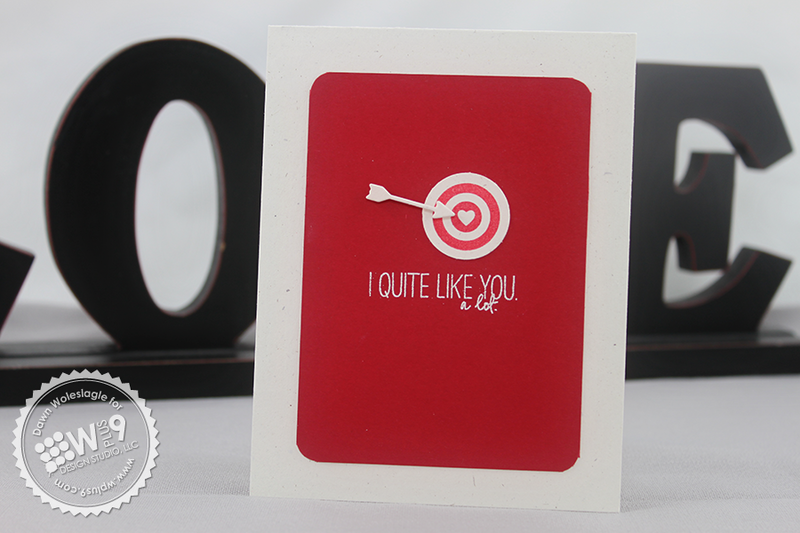 This card is all about the focal point. 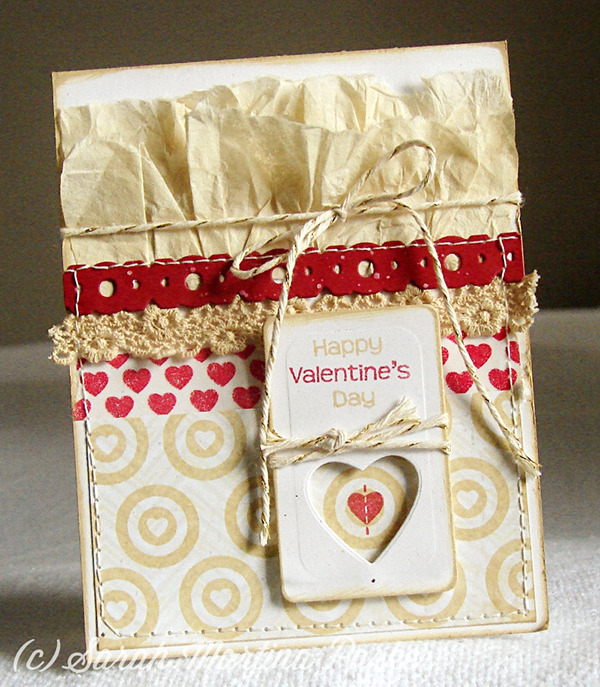 I die cut a pinked squared using our Clear Cut Stackers: Pinking Squares die and stamped the sentiment in brown. 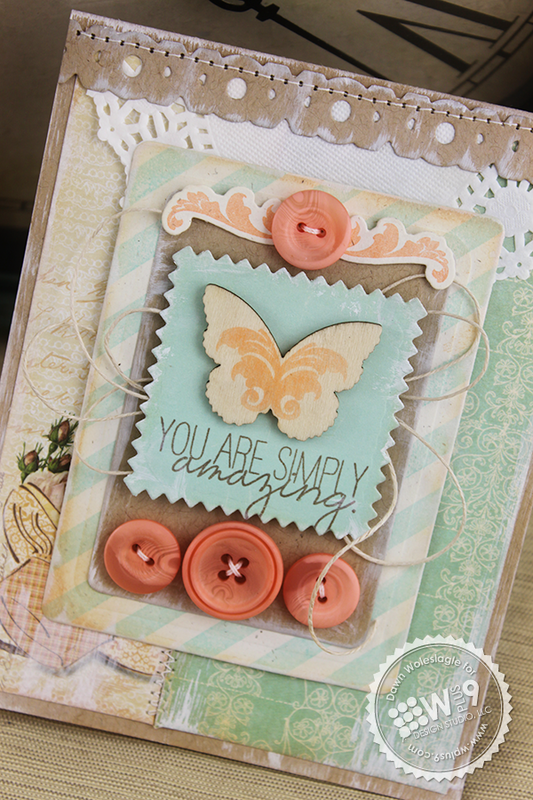 See that little flourish stamped onto the wooden butterfly from Studio Calico? That's one of the eleven flourishes included in Damask Delight! I love how perfectly it fits. 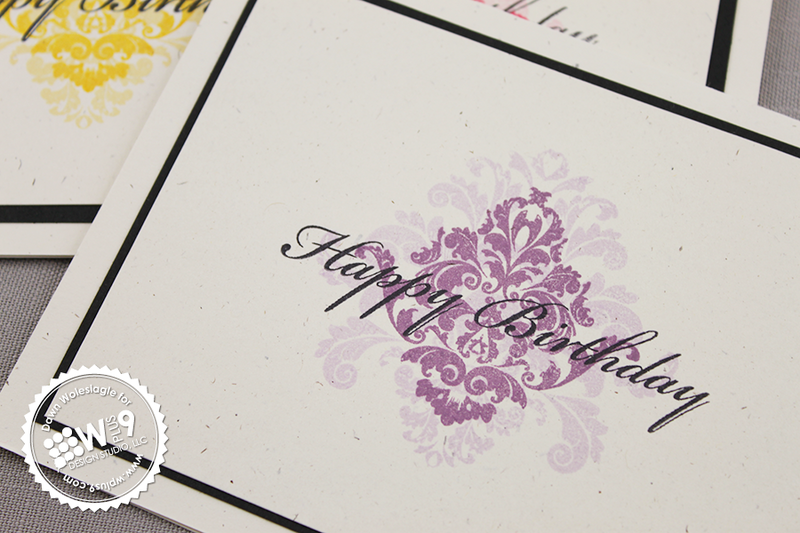 Another flourish was die cut from our Oatmeal card stock using the Damask Delight Companion Die and stamped with the matching image and added to the top. 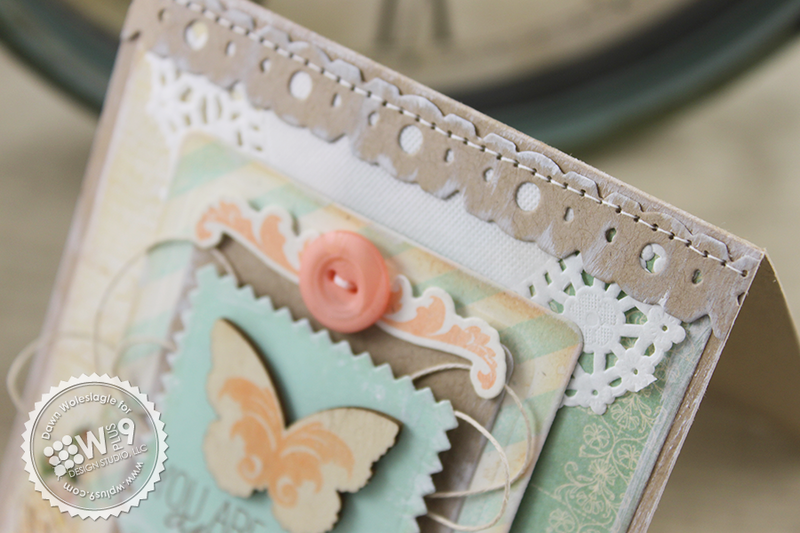 Along the top edge of the card, I used XOXO Border Die to cut a border from our Kraft card stock. 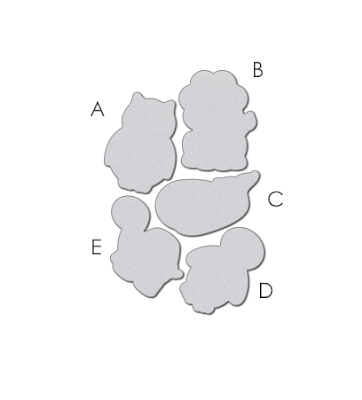 The Clear Cut Stackers: Rounded Rectangles were used again as a mat and flanked at the top and bottom with buttons. This is definitely my favorite card of the release. 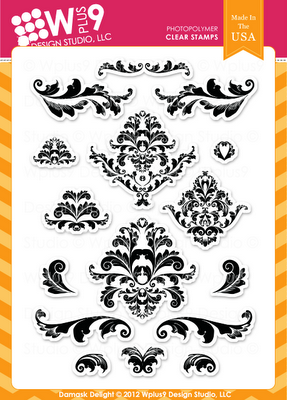 Now I know that there are plenty of Damask stamp sets on the market, but I guarantee that you will love all of the additional extras that come along with this set. So far I've shown you some of the flourishes included in Damask Delight, now let's take a look at some of the Damask images themselves. Creating a pattern is a given with these stamps, but I wanted to create a classic set of stationary cards that used the images as a focal point. I stamped the largest image first in a lighter color, and then stamped one of the smaller images directly over the first in a darker shade of the same color. See how much detail is packed into each of these images? A simple sentiment from Spring Post was added to the center. 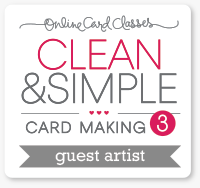 Simple, clean and perfect for gift giving or keeping on hand when you need a card in a pinch. 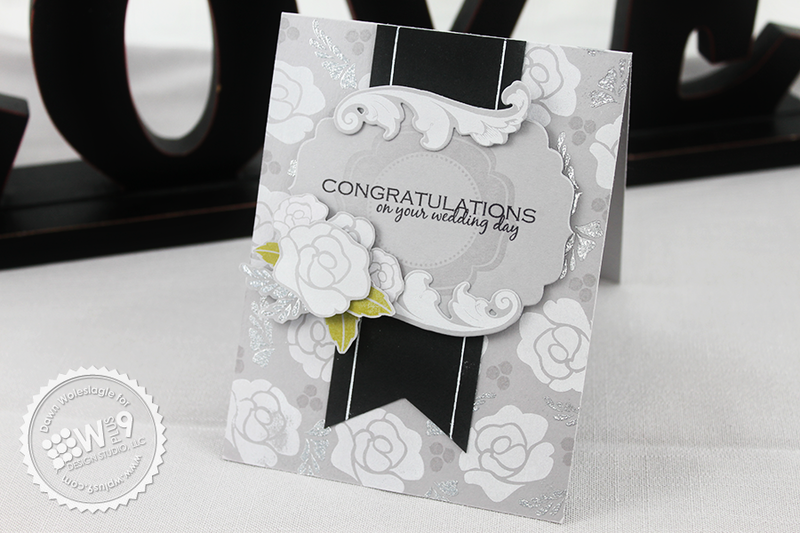 My final card today shows off some more of the flourishes in Damask Delight along with the companion die. 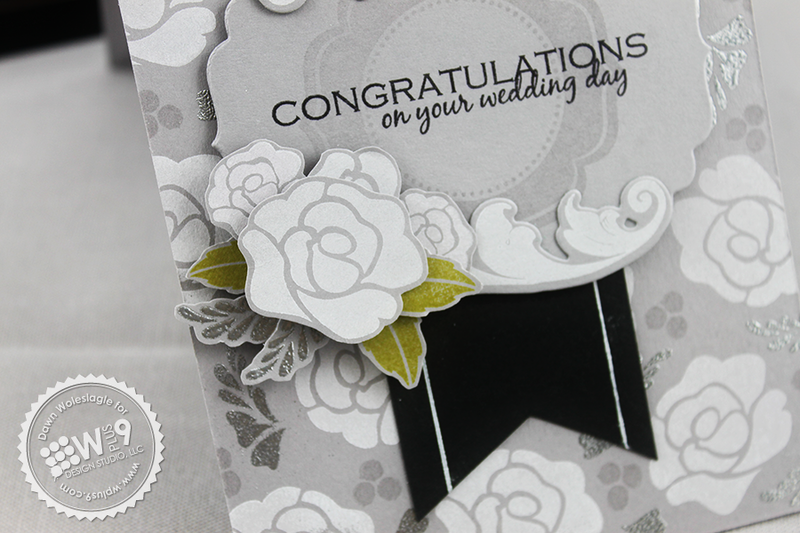 I wanted to create a fairly monotone wedding card and I knew these images would definitely up the elegance factor. I started with a Label Layers 2 die cut and stamped the label image from Brothers and Sister in the center. 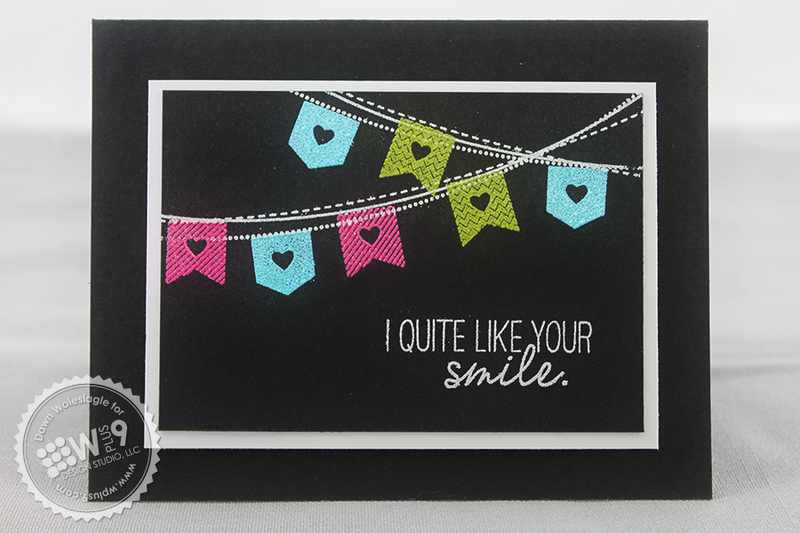 The sentiment from Damask Doilies was added using our Black pigment ink. 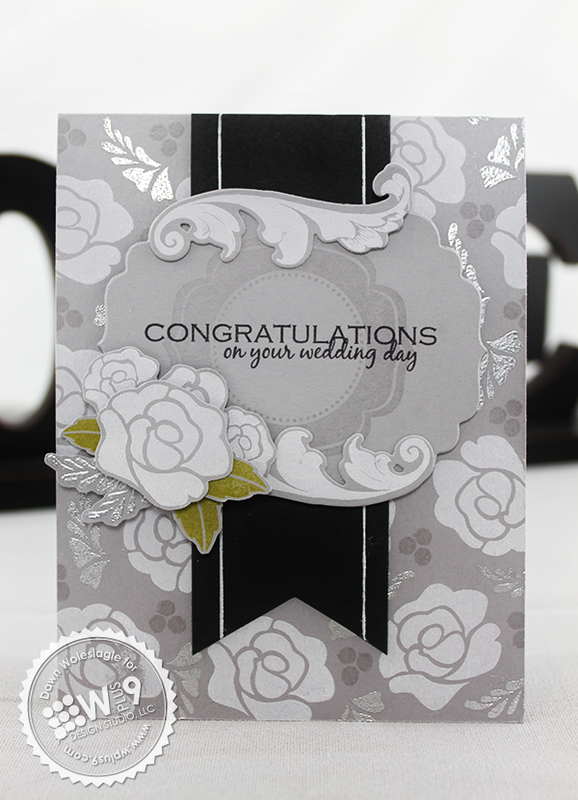 I die cut one of the flourishes from Damask Delight twice and stamped it with our White pigment ink. I added these to the top and bottom of the label. I created a little cluster of flowers on the left. I stamped a few of the flowers and leaves from Mother's Day Bouquet, cut them out and adhered them at different heights using foam tape. For the background I stamped several of the images fromMother's Day Bouquet. I used our White pigment ink for the flowers, Versamark for the berries, and embossed the leaves in silver. I really hope the special lady receiving this one loves it! Still want more? The Design Team has been blazing through these sets and they have more to share with you today too! 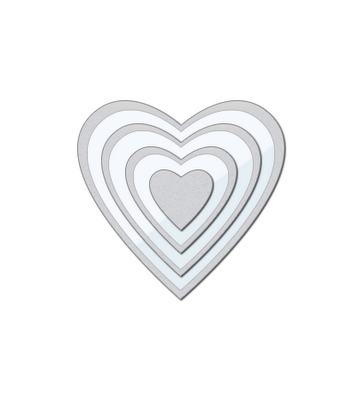 So, would you like to win today's featured products: Damask Delight, Damask Delight Companion Die, Quite Like You and the Clear Cut Stackers: Hearts dies? Just leave me a comment by 9:00 AM EST December 4th to enter. I will select one random winner from all comments. Winners will be posted here. Thanks for stopping by, I'll be back tomorrow with the FULL REVEAL and a chance to win the ENTIRE RELEASE! Hope you'll find time to drop by again! Welcome back! It's Day 2 of our December/January release. If you are just joining us, you can start at Day 1 to catch up. cuts 4 graduated hearts in the following sizes: 3 1/4", 2 1/2", 1 3/4", and 1". My first card today is ultra feminine and frilly. I think I managed to use a little bit of everything from this release on it. I started by stitching some Bella Blvd patterned paper to a Kraft card base. For the focal point, I cut one of the CCS: Rounded Rectangles from Oatmeal card stock and stamped the corners with a flourish from Damask Delight (more on that tomorrow) and added some buttons and the smallest heart from the Clear Cut Stackers: Hearts die. That adorable cupid is from Cupid's Arrow. I die cut and stamped him and then covered him with glitter. 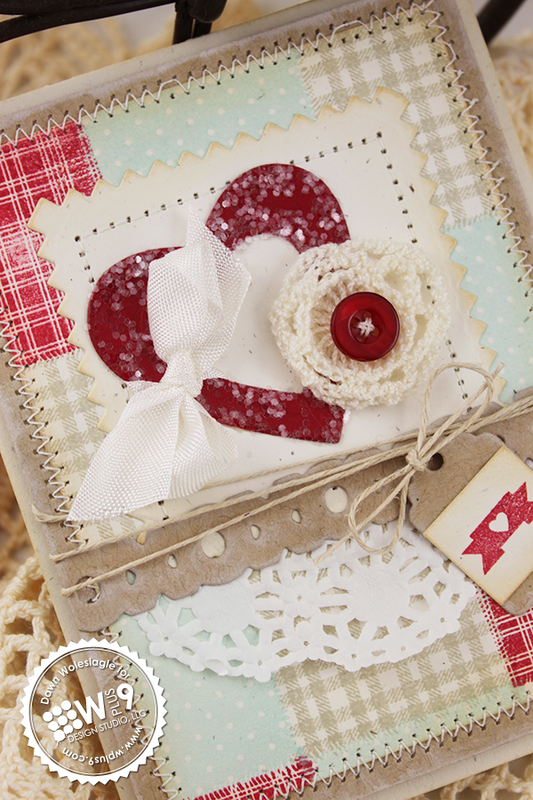 I added a little tag using Timeless Tags to the bow and stamped a heart from Banner Love. 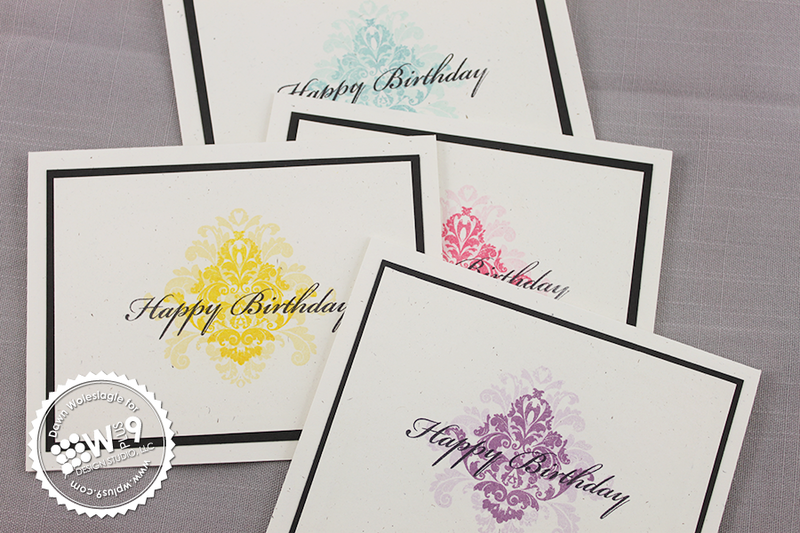 The little banners on the left side were stamped with Defining Words and then die cut using the Banner Trio Die. 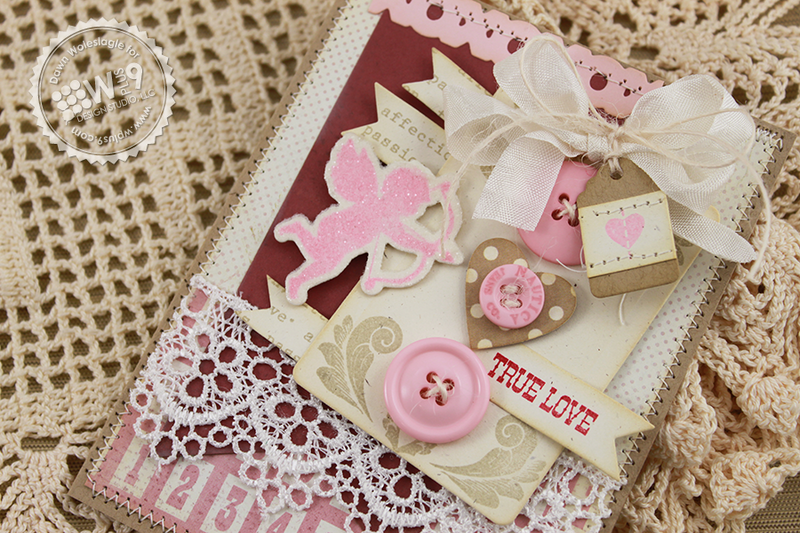 The XOXO Border Die was perfect for bringing a little bit of pink up to the top of the card. I needed to bring a little red over to the right side, so I added another banner and stamped "True Love" from Cupid's Arrow in red. I decided to keep rolling with the same basic layout, but switch up the elements for the next card. A little help from Webster's Pages patterned paper and I came up with this. An envelope stuffed with love letters! 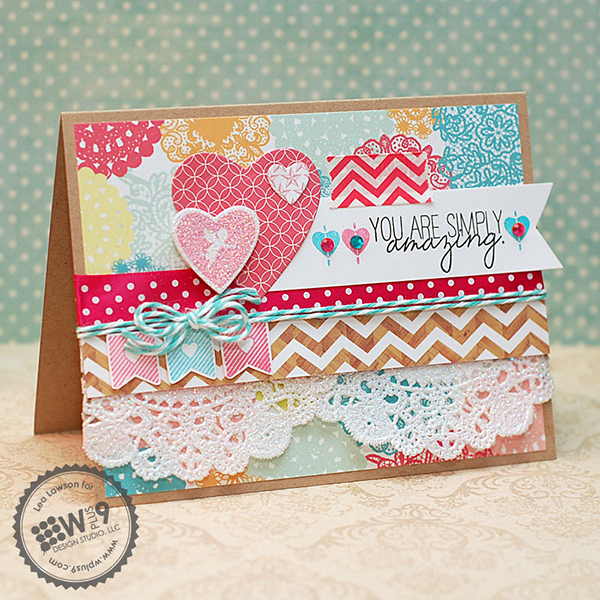 I filled our Vintage Envelope Die with a few letters cut with our Love Notes die. 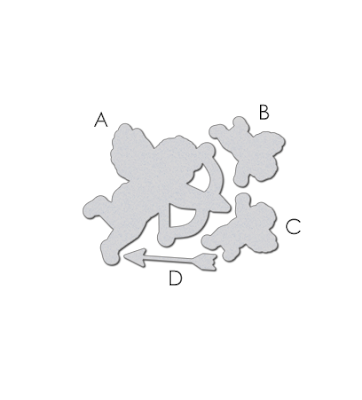 The little cupid pulling the letter out is also from Cupid's Arrow. There are two facing each other so you can have them hold banners, pennants and anything you can imagine. 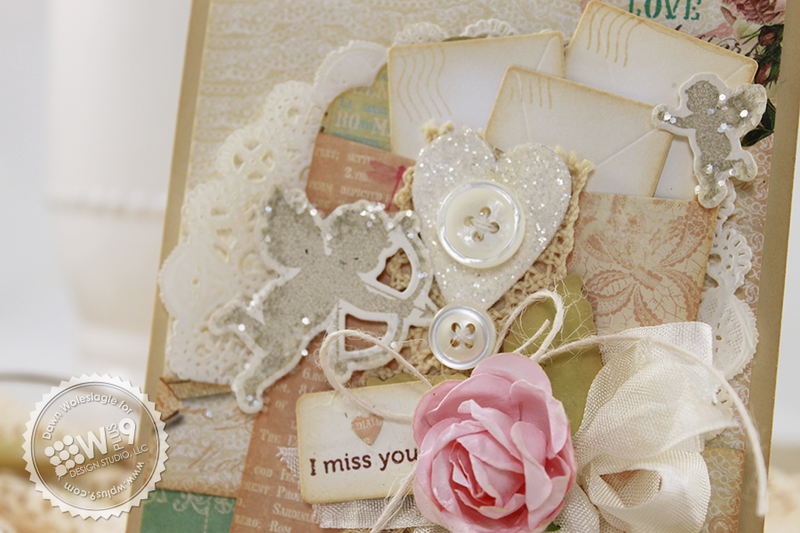 The center of the envelope is decorated with some trim, a few buttons and a glittered heart. 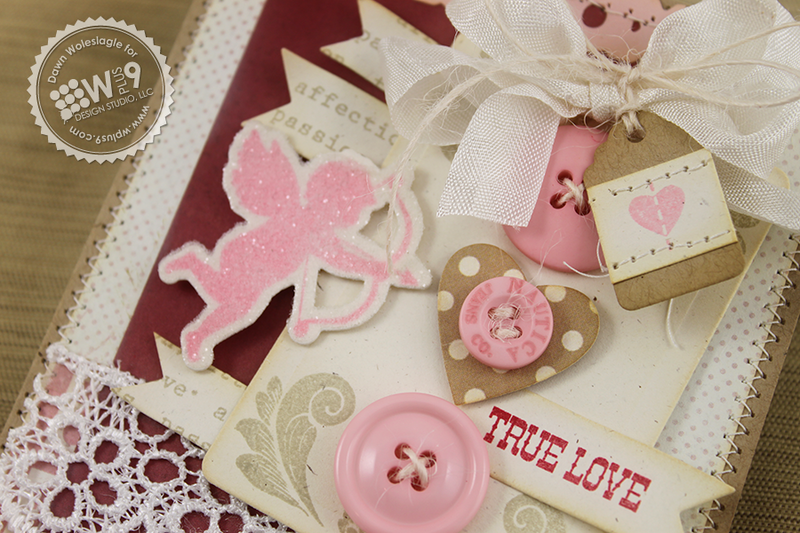 Another cupid, a cluster of flowers and a sentiment tag finish this one off. Those little guys are so much fun to use. I'm telling you, I could put them on everything! There are several sizes included in the set and they are facing left and right. 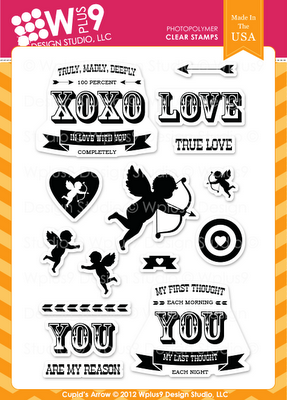 There are also quite a few great graphic sentiments and accent elements included in Cupid's Arrow. 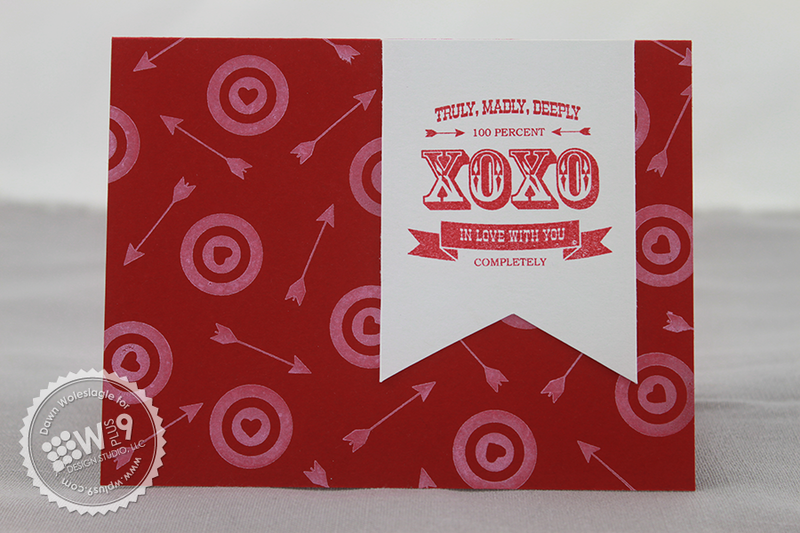 Here, I used the arrow and target to stamp out my background pattern in White pigment ink onto Cupid's Bow card stock. The pattern is so bold that all I needed to do was stamp my sentiment onto a banner and call it done! Keeping it clean and simple, I decided to go with a little black on black embossing. 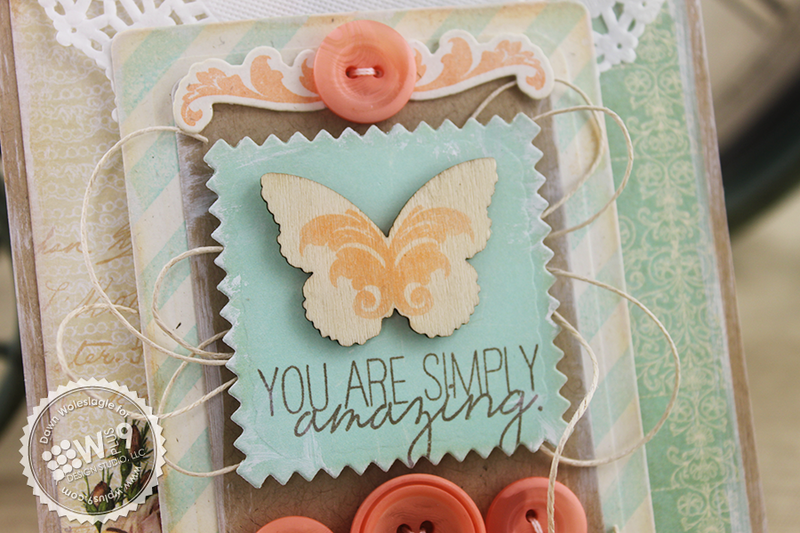 The background was stamped and embossed using Background Builders: Hearts. 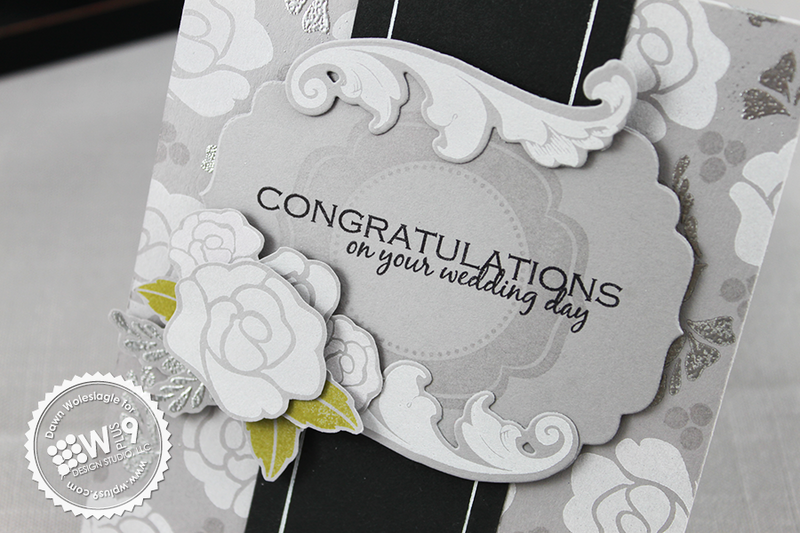 The sentiment was also embossed, but in white this time onto a Label Layers 3 die cut from Cupid's Bow card stock. 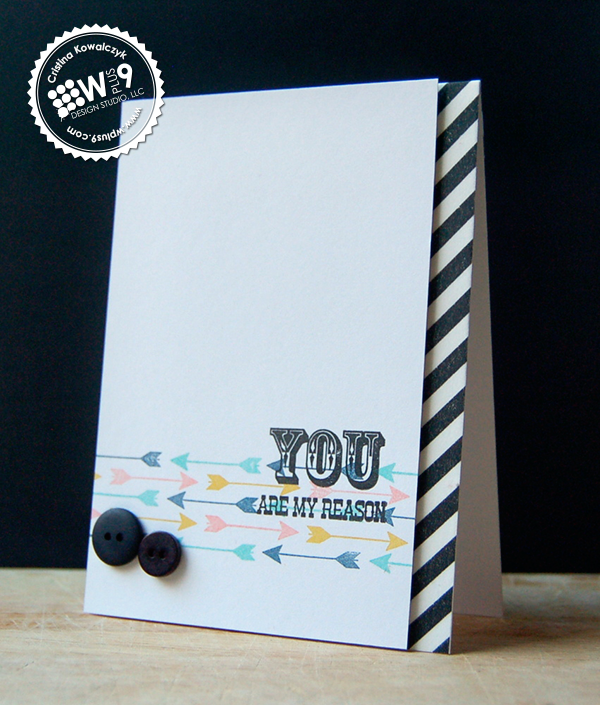 All little more of that XOXO Border Die under the label is perfect for anchoring it on the black. For my last card, since I already had all of the embossing stuff out, I decided to try out some of the colored embossing onto Black card stock. I used the individual banner images from Banner Love along with the string from Heartfelt Mix to create some vibrant bunting. The sentiment is a little peek at another set we will be introducing tomorrow. I am seriously having so much fun with these sets, and I've only scratched the surface! I love how they can go either way and fit any style. I hope you have enjoyed the previews today. I will be back with the final introductions tomorrow, but the Design Team has so much to share today too! They are amazing! 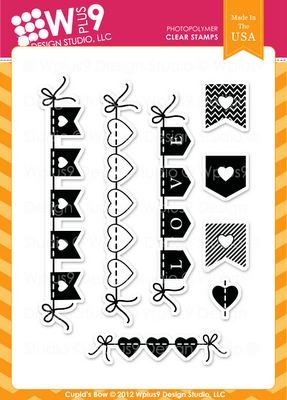 So, would you like to win today's featured products: Cupid's Arrow, Cupid's Arrow Companion Die, Banner Love and the Clear Cut Stackers: Hearts dies? Just leave me a comment by 9:00 AM EST December 3rd to enter. I will select one random winner from all comments. Winners will be posted here.